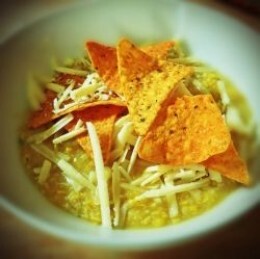 Corn soup is souper easy to make (did you see what I did there?). It looks fresh and inviting and whilst it’s basically a really healthy, cheap meal, you can make it into a junk food favorite by using heavily flavored corn tortilla chips and extra cheese. To stay on the healthier side, skip the cheese and go easy on the corn chips. Don’t leave them out though, otherwise it would just be two-corn soup, and that would be a whole different experience. You could even take it down to one-corn soup by leaving out the cornmeal/polenta if you don’t have any on hand, but I think it adds a bit of a smoother consistency and holds it all together. Where I live now fresh corn is expensive, think $2-3 an ear, and the stuff I grow myself probably works out at about $15 a cob if I costed it properly, before labor, but it is soooo tasty. If you live in the land of the roadside corn seller, stop, buy lots and make soup. I will be jealous. I generally use canned corn because I make this soup as a store-cupboard standby. Frozen corn works just as well, but defrost it before the processing step. You could use fresh corn if you have a glut, but cook it first otherwise you’ll have a bit of a starch situation. I’ll often up the garlic and chilli quantity in the winter as I like spice, but if I’m making it for more tender palates I’ll town it down, or even use Mrs Dash instead of fresh chilli and garlic. I usually opt for cheddar, simply because there’s always a little chunk of cheddar that needs using up at the back of the refrigerator, but Red Leicester works well. I’ve tried it with a “Mexican cheddar” which has been made with chilli and cilantro already in it, that works great. This is the sort of texture you’re aiming at when you zap your veggies, smushed up but with visible pieces rather than a liquid. I’m an old fashioned girl and tend to make my soups in a soup pot, but a friend recently invested in a soup making contraption and it’s changed her life, well, it’s changed her lunchtimes at least. It’s a thing of wonder. She puts roughly chopped veggies and stock in it, and goes about her business, and the machine heats it up, purees the vegetables, cooks the soup and keeps it warm. My birthday is in the autumn, in case you were wondering. Is canned corn as good as fresh for making soup? Would you be happy using canned corn in recipes or are you dedicated to straight off the cob? How about in winter and spring, would you rather go without until you can get the real deal?